Titus Flavius Domitianus, known as Domitian, was born at Rome in AD 51. He was the son of the emperor Vespasian and his wife Flavia Domitilla. Domitian acceded to the throne upon the death of his brother Titus in 81, and ruled until he was murdered in the Imperial Palace in 96. His death marked the end of the Flavian dynasty. The local coinages of Domitian are on a comparable scale to those of Nero and thus second only to the Greek Imperial issues of Augustus. At least ninety mints struck in his name, though as in the case of his elder brother some types were produced before he became emperor. His wife, Domitia, was honoured with a coinage greater than any other empress up to this time, in marked contrast to her Roman coinage, which is of considerable rarity. 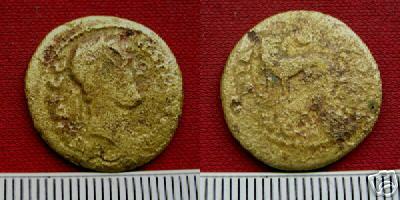 Sear describes a Domitian/Apollo-Didymaeus type from Miletus (1982: #825), but does not list this Domitian/Lion type. It appears to be the same general type as ANS 1944.100.46597, although that specimen is substantially lighter than the example below. Compare also SNG Copenhagen (1982: #1015, 4.56 g), which features a reverse lion to right (rather than to left) within a laurel wreath (rather than a dotted border). I do not have any other references available that might provide additional information. RJO 117. Bronze 20 × 22 mm (3.59 g, ↑↓), AD 81–96; harshly cleaned. Obverse: bust of Domitian right; inscription around margin; dotted border. Reverse: lion standing left, looking back at sun/star; inscription to left and below; dotted border.